Van Egmond Fertilized Garden Soil is an organic soil conditioner based on peat and compost. Garden soil can be used to improve the overall soil structure of your garden. It's important to thoroughly mix the Garden Soil with the soil already present in your garden in order to create a homegeneous structure. This will prevent 'layering', which could cause flooding. Unmixed Garden Soil is explicitly not meant for directly planting greenery or trees. We advise to mix the Garden Soil with Potting Soil or your existing soil in a 50-50 substrate. 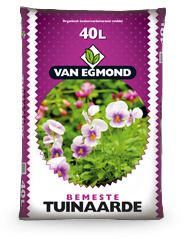 Van Egmond Fertilized Garden Soil is available in bags of 30 or 40 litres. Order fertilized garden soil directly through our order form!